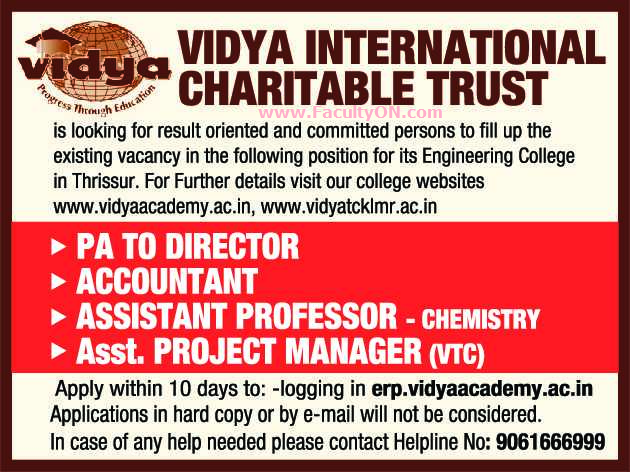 Vidya International Charitable Trust, Thrissur has advertised in THE HINDU newspaper for recruitment of Assistant Professor Plus Non-Faculty jobs vacancies. Interested and eligible job aspirants are requested to apply within 10 day from 08th August 2018. Check out further more details below. About College: In the year 1999 a group of philanthropic Keralites living in the United Arab Emirates met together with the initial intention of interacting and knowing each other better. After a few gatherings, everyone felt that they should do something tangible to help their home state, Kerala. After all, they are what they are now because of the love and support given by the society back in Kerala. Therefore, they should give back something without expecting anything in return.